Leonid Plashinov-Johnson was a student at the Yehudi Menuhin School in Surrey, England, where he studied with Lutsia Ibragimova. Since then, he has studied with Andriy Viytovych and currently studies with Kim Kashkashian at the New England Conservatory, where he recently won their 2018 Concerto Competition. He has performed as a soloist, chamber musician, and an orchestral member in many venues across Europe, Asia, and the United States including Wigmore Hall, Jordan Hall, Windsor Castle, Musicgebouw, Saanen Church, and Solsona Theatre. Mr. Plashinov-Johnson received top honors at the 2015 International Competition “Young Virtuosos” held in Sofia, Bulgaria. 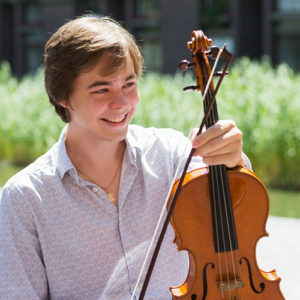 He has toured Asia as part of the Covent Garden Soloists Orchestra and recently debuted at the Walt Disney Concert Hall in Los Angeles as the principal violist of the Kaleidoscope Chamber Orchestra. Other recent engagements include concerts with the Parker Quartet. Mr. Plashinov-Johnson is a founding member of the Alderney Chamber Music Festival, which launched in 2017 in the Channel Islands.